What is the attraction to Walking With Purpose? WWP is a fresh, relevant and focused study of Scriptures, approved by the Catholic Church, that aims to open the heart where real change happens, and not just intellectual development. 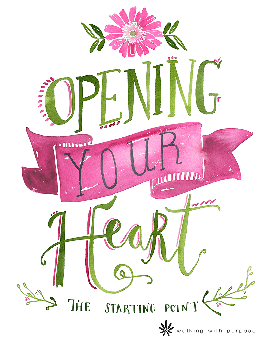 With an open heart, we can receive God’s graces. Graces that He wants to bestow on us. When hearts change, so do behaviors and attitudes toward everyone and everything that is part of our life. The small group experience is valued. Joy, energy, enthusiasm ……spills out of the classrooms every week. 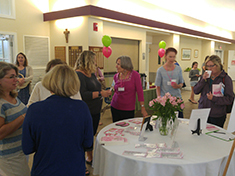 The women are truly glad to see one another and grateful to have a setting to talk about God, their faith, or challenges with it, and to share insights from the lessons with each other. They form a real sense of community. That is the beauty of the program. We see ourselves changing. WWP is a life-changing encounter with Christ as we never knew Him. We are all seeking a relationship with God, or we would not go to Mass. Each day He gives us opportunities to be closer to Him. In the summer of 2002, Lisa Brenninkmeyer, a convert to Catholicism, developed the bible study program called Walking with Purpose. 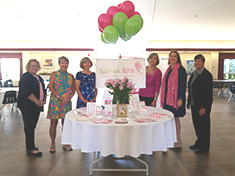 Walking with Purpose reaches out to women who desire to grow in their faith using a Scripture-based program that is fresh, relevant and focused on conversion of the heart more than intellectual development. WWP is a growing National program, that when we started our chapter in 2012, it had less than 1000 participants nation- wide. This year that number passed 9,000; all in 4 years! That shows the true desire and hunger for a deeper spirituality, and for real connections with other women in the community. 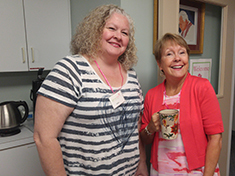 WWP is part of the spiritual movement in the Church that is reaching more and more women and their families. 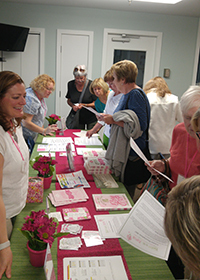 Last year our chapter had over 70 women, from parishes all over the Cape, who came together weekly, in small groups, to go over a Scripture-based lesson they had read at home. The women were of all ages and stages in life. Most had no Bible experience. Some were not regular church goers. What they share is a curiosity and desire to examine their faith and their relationship with God, hoping to make it more meaningful, and, a conscious part of their everyday activity. 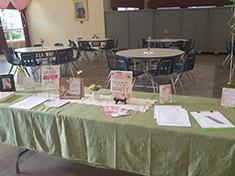 In regards to WWP growing, one of our members went back to her parish in Bourne, and has started a new chapter of WWP at St. John the Evangelist. Over 35 women have signed up. 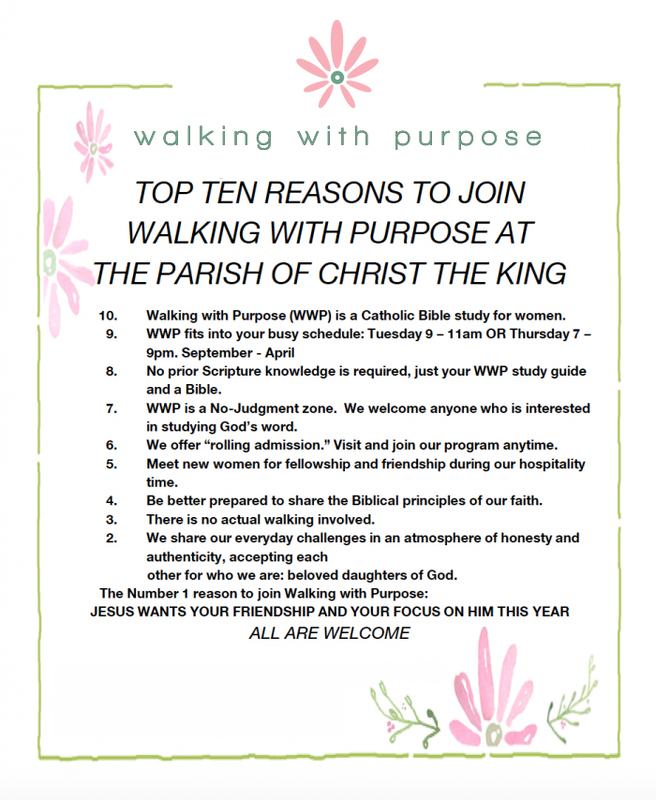 You or you and a friend want to “Walk with Purpose”? Please join us in Classroom B, and experience a room filled with positive, welcoming energy, and a lot of smiles. Opening Your Heart~the foundational course of the program. It is a guide to transforming one’s heart and relationship with Christ, by exploring core questions of faith if we want to experience all that God has intended for us. 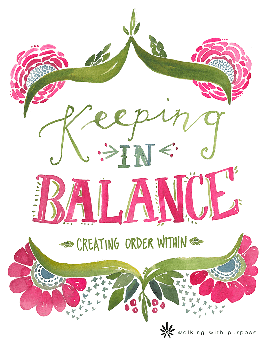 Keeping in Balance~is about creating balance within by developing responses to life with more awareness of what influences our choice’s. It explores Scripture for ideas in managing life’s pace, expectations, desires, and pressures with calm and steadiness. 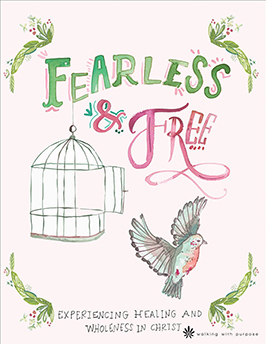 Fearless and Free~is based on Ephesians, emphasizing healing and wholeness. A personal and transformative study.